In her extensively researched exploration of China in British children’s literature, Shih-Wen Chen provides a sustained critique of the reductive dichotomies that have limited insight into the cultural and educative role these fictions played in disseminating ideas and knowledge about China. Chen considers a range of different genres and types of publication-travelogue storybooks, historical novels, adventure stories, and periodicals-to demonstrate the diversity of images of China in the Victorian and Edwardian imagination. Turning a critical eye on popular and prolific writers such as Anne Bowman, William Dalton, Edwin Harcourt Burrage, Bessie Marchant, G.A. 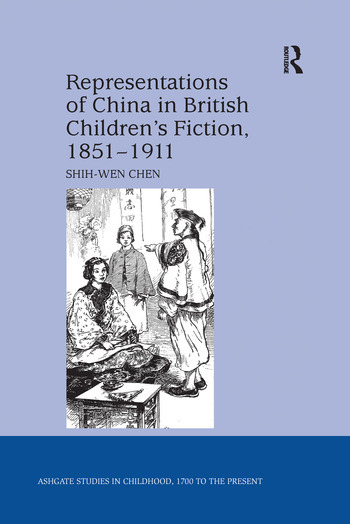 Henty, and Charles Gilson, Chen shows how Sino-British relations were influential in the representation of China in children’s literature, challenges the notion that nineteenth-century children’s literature simply parroted the dominant ideologies of the age, and offers insights into how attitudes towards children’s relationship with knowledge changed over the course of the century. Her book provides a fresh context for understanding how China was constructed in the period from 1851 to 1911 and sheds light on British cultural history and the history and uses of children’s literature. Contents: A kaleidoscope of knowledge: children, knowledge, and China in Victorian and Edwardian Britain; Exploring the Celestial Kingdom: William Dalton and Anne Bowman’s vision of China; From comic trickster to brilliant detective: E. Harcourt Burrage’s ’immortal’ Ching-Ching; Heroes and hostile hordes: representing the Taiping Rebellion (1850-1864); China against the allies: interpreting the Boxer Uprising (1899-1901); Conclusion: quilts and kaleidoscopes: visions of China in the literary imagination; Appendix: timeline; Works cited; Index. Shih-Wen Chen is Lecturer in Literary Studies at Deakin University, Melbourne, Australia. Her research interests include children’s literature, print culture, and histories of reading.